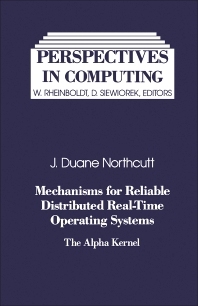 Mechanisms for Reliable Distributed Real-Time Operating Systems: The Alpha Kernel deals with the Alpha kernel, a set of mechanisms that support the construction of reliable, modular, decentralized operating systems for real-time control applications. An initial snapshot of the kernel design and implementation is provided. Comprised of seven chapters, this volume begins with a background on the Alpha operating system kernel and its implementation, followed by a description of the programming abstractions created for the Alpha kernel. The third chapter defines the client interface provided by the kernel in support of the given programming abstractions, while the fourth chapter focuses on the functional design of the kernel. The hardware on which the kernel was constructed, as well as the implications of this hardware on the design and implementation of the kernel, is also examined. The final chapter compares Alpha with other relevant operating systems such as Hydra, Cronus, Eden, Argus, Accent, and Locus. This book will appeal to computer scientists, systems designers, and undergraduate and graduate students of computer science.